Carlos Runcie-Tanaka is a Peruvian ceramicist. The show at The Station Museum of Contemporary Art consists of four pieces, three of them very large and requiring rooms of their own. If there was ever a show that one could call spooky, this was it. The light was low in the galleries. Tuneless flute music played softly in the background. This one is called Huayco/Kawa/Rio. 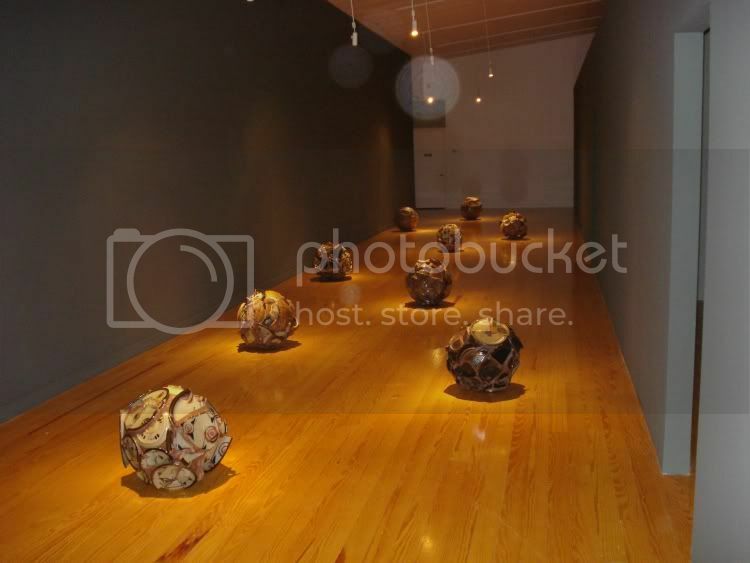 The spheres are made from broken ceramic shards. The random arrangement reminds one of stones in a riverbed. The photo above doesn't really succeed in matching the uncanny feeling of being in the flow of a river that one has walking through this piece. This one is called Tiempo Detenido/No Olvidar. The photo is a bit fuzzy because I shot it with existing light. 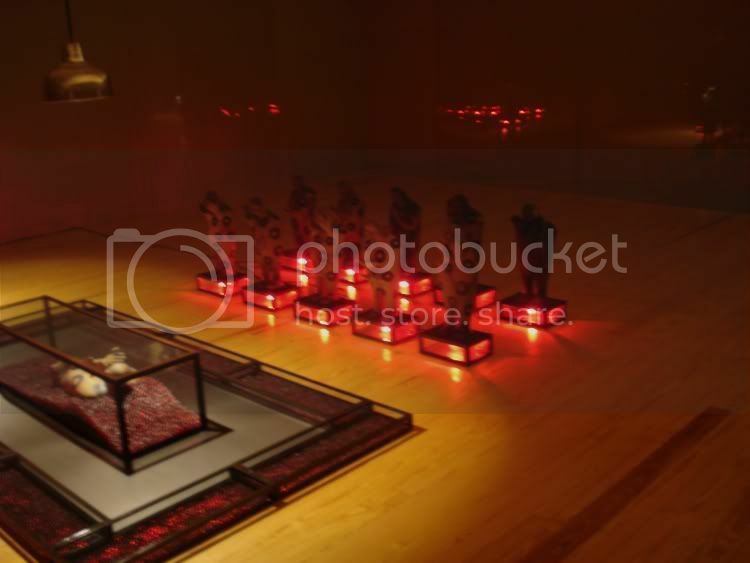 That was necessary--this room is completely dark except for the spotlight on the central figure and the red lights coming from beneath the mourners. It appears to be a funeral scene. It was apparently inspired by a real incident in Runcie-Tanaka's life. He was a guest at a Japanese embassy reception when the compound was invaded by members of the Tupac Amaru Revolutionary Movement (MRTA). This hostage event was the MRTA's last hurrah--Peruvian President Alberto Fujimori sent in the military to rescue the hostages. One hostage was killed (I presume that hostage is represented by the dead figure in the ceramic group), and all the guerillas were killed--eight of them by summary execution after they had surrendered. The Station Museum frequently shows political art, but despite the inspiration for the piece above, and the dedication of the show to the recent victims of violence in a clash between police and indigenous protesters in Peru, this is not a political show. The art is contemplative. The textures and colors and shapes, as well as the siting of the art, inspire the viewer to linger. Runcie-Tanaka's work will be up through mid-October, so make a point of seeing it.